This coming offseason’s class of free agent shortstops doesn’t have the same star power as the one that featured Jose Reyes and Jimmy Rollins a year ago. Marco Scutaro and Stephen Drew lead a group that includes a number of backups and Alex Gonzalez, who missed the final five months of the 2012 season with a knee injury. In theory, Jhonny Peralta could also hit free agency. But it seems more likely that the Tigers will exercise their $6MM club option and keep Peralta in Detroit for another year. The Tigers don’t have a Jurickson Profar or Manny Machado-type shortstop prospect in the organization, so they’ll need to acquire someone to play the position in 2013. President and GM Dave Dombrowski could explore trades for players such as Elvis Andrus, J.J. Hardy and Yunel Escobar, but the asking prices figure to be high for each player. A weak free agent class and a potentially competitive trade market could improve Peralta’s chances of returning to Detroit. Peralta hasn't produced on offense the way he did in 2011, the first season of his two-year, $11.25MM contract with Detroit. He has a .251/.311/.404 batting line that's slightly better than average for his position (MLB shortstops are hitting .255/.307/.377). Though Peralta's home run total has dropped from 21 in 2011 to 11 in 2012, he has added 31 doubles and three triples in 502 plate appearances. While Peralta’s not thought of as an above-average defender, his defense is considered acceptable. He's a decent defensive shortstop even if he's not much fun to watch, according to a pre-season scouting report in The Fielding Bible Volume III. 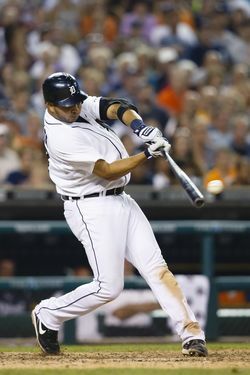 UZR suggests the 30-year-old has played above-average defense since signing his two-year deal with the Tigers. Advanced metrics say Peralta's adding value for the Tigers. FanGraphs' version of wins above replacement values Peralta at 2.7 WAR in 2012. Baseball-Reference, on the other hand, suggests Peralta has been worth 1.4 WAR. The metrics agree on this much: he’s a contributor at a premium position. Sometime this month Peralta will appear in his 140th game of the season, reaching the threshold for the eighth time in as many seasons since 2005. Injuries can strike at any time, but Peralta’s history of staying healthy compares favorably to that of Drew or Gonzalez. If the Tigers were to decline Peralta’s option, it wouldn’t be surprising to see the ACES client sign a two-year contract like the one he signed following the 2010 season. Comparable middle infielders such as Aaron Hill, Mark Ellis and Clint Barmes signed similar contracts a year ago. At this point, however, it doesn't seem likely that Peralta will reach free agency. In a market light on alternatives at shortstop, his $6MM option figures to appeal to the Tigers. Everyone is calling for improved defense, I don’t see where else it is more needed than SS. We really need extended range at Short if Miggy is going to continue to play third. After emptying the cupboard for Sanchez and Infante (sigh), what do we have left to deal for an Andrus? Escobar is a sideways to downgrade move and Hardy is meh. Suarez is at least 2 yrs away…Jhonny comes back and hopefully gets back to nearer 2011 levels. The bigger issues are C RF and to a lesser extent 2b and LF…. Agreed, don’t forget a closer too. I dont know if our internal options are ready to close yet. I bet Garcia gets a chance next spring to win a OF spot. I would like to also see the Tigers bring in a vet to challenge for a spot. We have a top 10 2B. We don’t need a 2B. Probably don’t have what it takes for Andrus, unless you want to give up Castellanos, which is an option. They probably target Torii Hunter in FA. Left field could then be a platoon of Dirks and Garcia. Hypothetically, if the Tigers somehow did pull off Andrus, it would definitely help them. Remember when everyone wanted improved defensive play from SS when Guillen was there, and we got Adam Everett? There aren’t many great 5-tool SS’s out there. Be careful what you wish for. While the Tigers don’t have a top-notch SS prospect, they Dombrowski and Co. are very high on Eugenio Suarez, a nice looking 21 year-old prospect that just finished up a fine year for single-A West Michigan. I wouldn’t expect a trade for a guy like either of those three above.